Honorary Degree of Doctor of Art (DArt) in recognition of his outstanding leadership in art and design education and his promotion of the arts nationally and internationally. 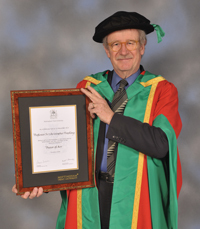 With a History degree from the University of Cambridge, Christopher Frayling taught the subject at the University of Bath and became Professor of Cultural History at the Royal College of Art in London, where he was also Rector 1996 to 2009. He has chaired the Design Council and the Royal Mint Advisory Committee – influencing coin design – and been a Trustee of the Victoria and Albert Museum and a governor of the British Film Institute. From 2005 to 2009 he was Chairman of Arts Council England. He is an accomplished author, critic, policy-maker, broadcaster, presenter and a successful champion for broadening the scope of cultural awareness and education. His personal favourites range from Ancient Egypt to Spaghetti Westerns. He was knighted in 2001 for Services to Art and Design Education.